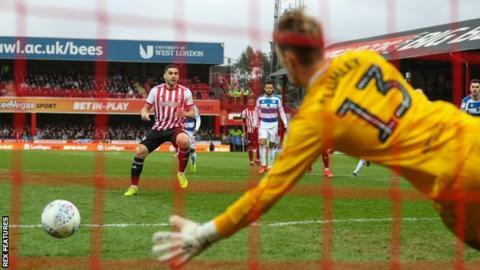 Brentford consigned Queens Park Rangers to an eighth defeat in nine games as they outclassed their rivals in the west London derby. Following a dour first half, Neal Maupay's cool penalty gave the Bees the lead after Grant Hall bundled over Ollie Watkins in the box. R's keeper Joe Lumley saved well from Said Benrahma and kept out a header from Henrik Dalsgaard before Maupay was involved in the hosts' second. The Frenchman beat the offside trap and rounded Lumley before squaring for Benrahma to tap in to an empty net, and Sergi Canos added a third in stoppage-time with a deflected effort. Victory gave the Bees a seventh consecutive win at Griffin Park in all competitions and continued their upturn under head coach Thomas Frank, who was appointed in October after Dean Smith joined Aston Villa. The Dane has now taken 24 points from the past 12 league games, having picked up just four from his first 10 matches in charge. Brentford keeper Daniel Bentley was not really threatened until second-half stoppage-time when he kept out an effort from Bright Osayi-Samuel before Tomer Hemed headed wide. QPR had ended a run of seven straight defeats with victory over Leeds in midweek, but that represents their only win in their past 12 Championship games stretching back to 29 December. Steve McClaren's side drop a place to 18th and are nine points above the relegation zone, while the Bees climb a place to 15th. Match ends, Brentford 3, Queens Park Rangers 0. Second Half ends, Brentford 3, Queens Park Rangers 0. Goal! Brentford 3, Queens Park Rangers 0. Sergi Canos (Brentford) right footed shot from outside the box to the top right corner. Assisted by Kamohelo Mokotjo. Attempt missed. Tomer Hemed (Queens Park Rangers) header from the centre of the box is close, but misses to the left. Assisted by Luke Freeman with a cross following a corner. Corner, Queens Park Rangers. Conceded by Daniel Bentley. Attempt saved. Bright Samuel (Queens Park Rangers) left footed shot from the left side of the box is saved in the bottom left corner. Assisted by Massimo Luongo. Offside, Brentford. Romaine Sawyers tries a through ball, but Moses Odubajo is caught offside. Attempt blocked. Jake Bidwell (Queens Park Rangers) left footed shot from the centre of the box is blocked. Assisted by Toni Leistner with a headed pass. Corner, Brentford. Conceded by Jake Bidwell. Attempt missed. Neal Maupay (Brentford) right footed shot from the centre of the box misses to the left. Assisted by Sergi Canos with a through ball. Substitution, Brentford. Emiliano Marcondes replaces Ollie Watkins. Attempt missed. Massimo Luongo (Queens Park Rangers) left footed shot from outside the box is high and wide to the left. Substitution, Queens Park Rangers. Matt Smith replaces Pawel Wszolek. Attempt missed. Jake Bidwell (Queens Park Rangers) right footed shot from outside the box is high and wide to the left. Goal! Brentford 2, Queens Park Rangers 0. Said Benrahma (Brentford) right footed shot from the centre of the box to the centre of the goal. Assisted by Neal Maupay. Attempt missed. Massimo Luongo (Queens Park Rangers) right footed shot from outside the box misses to the right following a set piece situation. Henrik Dalsgaard (Brentford) is shown the yellow card for a bad foul. Toni Leistner (Queens Park Rangers) wins a free kick in the attacking half. Offside, Brentford. Julian Jeanvier tries a through ball, but Neal Maupay is caught offside. Corner, Brentford. Conceded by Joe Lumley. Attempt saved. Henrik Dalsgaard (Brentford) header from the centre of the box is saved in the top right corner. Assisted by Said Benrahma with a cross. Bright Samuel (Queens Park Rangers) is shown the yellow card for a bad foul.